Improper grounding of a pressure, flow, level or temperature transmitter could compromise the successful operation of the device. Most transmitters will operate with the current signal loop either floating (ungrounded) or grounded. In a floating system, the extra noise affects many types of readout devices. If the signal appears noisy or erratic, grounding the current signal loop at a single point may solve the problem. The best place to ground the loop is at the negative terminal of the power supply. Do not ground the current signal loop at more than one point. Because of noise, the majority of process transmitters – pressure, temperature, level, flow etc – are required to be grounded for good operation. A transmitter is said to be properly grounded when the signal wiring and transmitter case are grounded. The signal wiring of a process transmitter should be grounded at ONLY one point on the signal loop or may be left ungrounded as in floating systems. 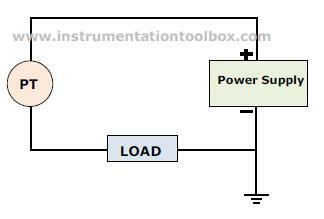 The negative terminal of the power supply is a recommended grounding point. For good grounding practice, do not run signal wiring in conduit or open trays with power wiring or near heavy electrical equipment. See How to Reduce EMI in control Loops and Instrumentation Systems . Trimmed and insulated from touching the transmitter housing or casing. The above grounding practice is very common in most plants however it pays to use the grounding options recommended by the facility for the specific transmitter type. The transmitter case must be grounded in accordance with national and local electrical codes. The most effective transmitter case grounding method is a direct connection to earth ground with minimal impedance. The transmitter case may also be grounded through the process or conduit connections however this may not provide sufficient ground continuity. Good transmitters are generally protected by integral galvanic isolation from potential damage from high voltage induced by welders, motor start¬ers, lightning strikes, switchgear and inadvertent exposure to power lines up to 500 to 700 VAC. However, lightning strikes and other induced tran¬sient over voltage events can cause spikes and surges at much higher voltage levels. For this reason, additional protection for receiving devices may be a wise investment for installation areas prone to transient over voltages. Many transmitters offer transient suppression options that can be integrally mounted onto the terminal strip within the housing. For other transmitters an external protection device may be used. External field mounted suppressors may not carry agency certification for explosion proof applications. A transmitter with an integral style suppressor should be the first choice for high risk applications.